Pet loss is most often associated with the death of animal, but can also be experienced through other scenarios – such as a relationship breakup, a relocation or a missing pet. People are no longer expected to grieve alone. Support is a phone call away. 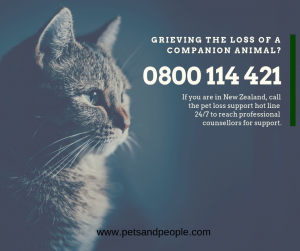 An New Zealand national hotline has been set up to connect grieving animal lovers with counsellors who can help them cope with their loss.